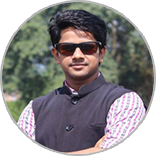 Gaurav Gupta, M.TECH. (Mechanical), IIT Roorkee. As we have titled Gaurav, The Proponent of Physics, he stands for it. Gaurav is a true enthusiast and lover of physics and has a great art of linking everything with his physics knowledge and tries to give all lively examples to students and connect them with the real life physics. Gaurav believes that education is not that we make students learn and write in exams but is more of feeling the natural laws and applying them in day to day life. Gaurav’s success rate in the field of education shows his interest in the subject, till date almost 75% of the students guided by Gaurav are in the top notch colleges and are excelling in their fields.